Les Contamines-Montjoie is a traditional mountain village nestled right at the base of Mont Blanc. The Les Contamines ski resort has been developed in a way that it lunges almost 5km along the valley, interlinked by footpaths criss-crossing the village and allowing relatively easy access to each of the little hamlets. To reduce car travel, Contamines Montjoie set up a shuttle bus service to get around the village and to also get to the bottom of the ski lifts. If bus travel isn't for you, there are also horse drawn carriages which can take visitors to bottom of the slopes, stopping off for a snack on the way! The ski resort of Les Contamines / Hauteluce enjoys an exceptional amount of sunny weather and natural snow on both sides of its two major valleys, the Val Montjoie and the Beaufortain. The ski slopes meander down through each of the valleys, wide ski runs, surrounded by ancient forests, high altitude cabins and mountain farms. To make sure that the season lasts, there are 175 snow canons in place, toping up the natural snow through the early and late season. The Les Contamines ski area has 120 km of varied ski slopes for all abilities. 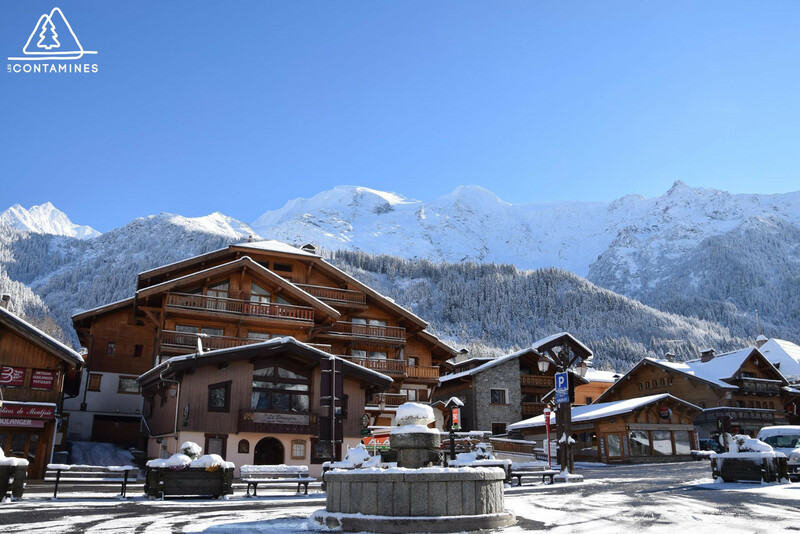 In the upper part of the resort there are excellent panoramic views, accessible on skis, overlooking the biggest mountain in Western Europe, Mont Blanc. In the lower parts of this ski paradise, find yourself skiing amongst the forests, great on the rare cloudy days. Note that the Evasion Mont-Blanc ski pass that you can purchase in Les Contamines also allows access to Saint-Gervais, Megeve, St Nicolas de Véroce, Combloux and La Giettaz. Six ski resorts that total more than 445 km of marked ski runs. To show that the resort is committed to the development of the new disciplines in skiing and snowboarding, Les Contimines has introduced their X-Zone. There are multiple zones set aside for the new freestyler generation, whether on skis or on a snowboard: - The ‘X-Zone des Loyers', situated in the heart of the village is an area set aside for the lovers of aerial acrobatics. The super-pipe, which hosts rounds of the world cup, is the pride of the Les Contamines ski resort. - The ‘X-Zone de Tierces', built on the Tierces ski run right at the top of the resort is made up of a series of obstacles, jumps, rails and a boarder cross course, accessible to skiers and snowboarders of all abilities. The cross country ski area has 23.5 km of well maintained, specially built ski trails. There is a beginner cross country ski area close to the welcome centre. If you want to give cross country skiing a go, access is free. The area is open from the first snowfall, propelling visitor's right into the heart of a real wintery alpine mountain environment. Les Contamines caters for all age groups, offering a mix of activities for everyone! The nursery ‘La Galipette' welcomes kids from 1 to 7 years old. It has several different play rooms, encouraging active learning, and a secure outside play area which has an array of snow related games and activities to keep the little ones amused. For sleepy ones the nursery also has a room set aside for naps and a little rest after a long day playing in the mountains! After a hard day on the slopes visitors can enjoy Les Contamines terrace bars and cafés. A range of evening entertainment is organised throughout the winter season, or if that's not for you, you can always make the most of the calm in the village's library. Get snow reports and powder alarms from Les Contamines Montjoie straight to your inbox!